By default, the VMware ESXi 5 server is secured with a self-signed SSL certificate. This allows you to secure the connection to the ESXi server, but it also causes a warning about its certificate, because it doesn't originate from a trusted CA. This is normal, because the server has delivered it to itself. 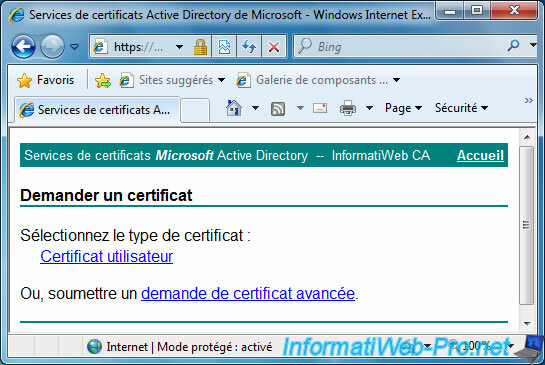 your certification authority created under Windows Server or Linux. Warning : this requires a little configuration on client computers. If the client workstations are linked to the Active Directory, then follow this. For this tutorial, we have to create an Active Directory server and a certification authority under Windows Server 2012. 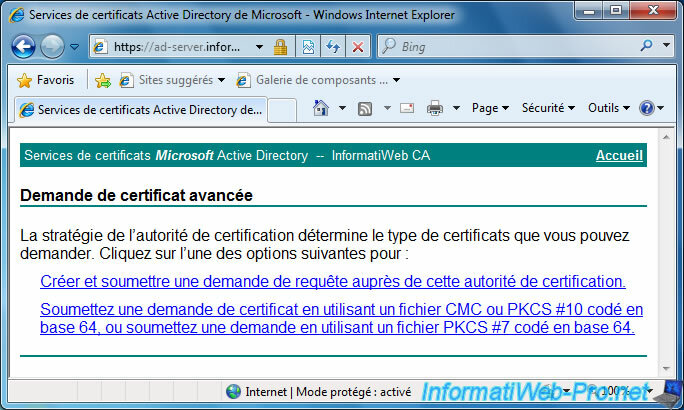 In this case, the Active Directory server allows us to automatically distribute our CA certificate to the client PCs in our network. Thus, all PCs in our network recognize our certification authority as a trusted certification authority. The certification authority (CA) will allow us to create a valid certificate for our ESXi 5.0 server. To be able to secure your ESXi server with a valid SSL certificate, your VMware ESXi virtualization server must have a domain name or a simple name. 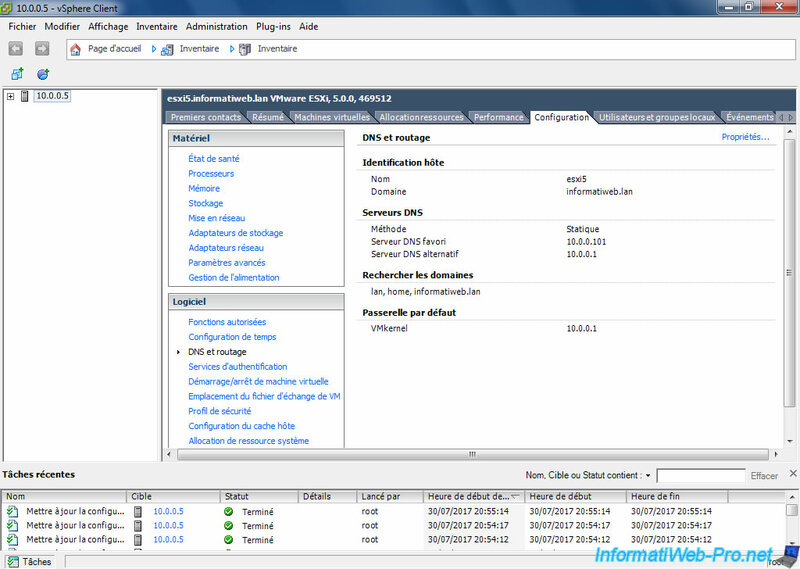 Since we have an Active Directory server in our network, our ESXi server will be part of our "informatiweb.lan" domain. To get started, connect to your ESXi server with the VMware vSphere Client (direct link for the 5.0 version). 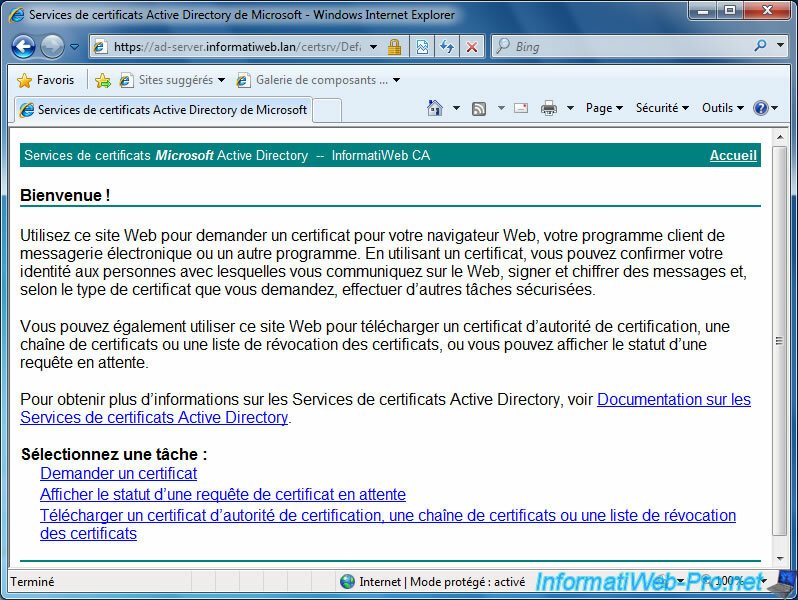 For now, a warning is displayed because the certificate is self-signed and delivered to localhost.lan. Since the address doesn't match the address used when connecting to the server, this warning is displayed. To change the name of your ESXi server, click Inventory and go to the Configuration tab. Then, in the left menu, click "DNS and Routing". To finish, on the right, click on the "Properties" link located at the top right. To change the name of your server, you must first select the "Use the following DNS server address" option. Since the installation of our Active Directory server also caused the installation of a DNS server, we take advantage of it to provide it as the preferred DNS server. Then, we specify the IP address of our router as the alternate DNS server. Finally, if your server is part of a local domain, you can also add your local domain name in the "Look for hosts in the following domains" box. For this domain name to point to your ESXi server, you will also need to create a new A record in your local DNS server. 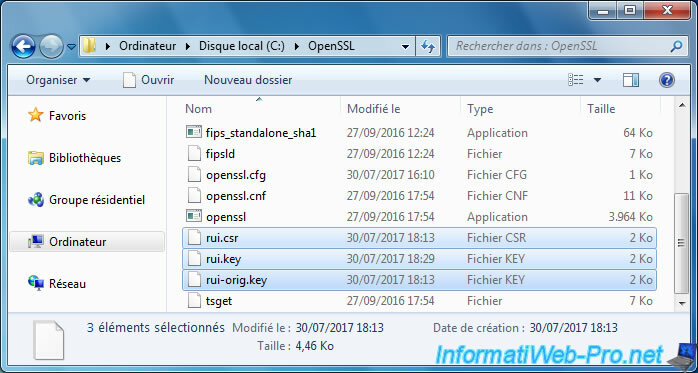 Download OpenSSL for Windows and unpack the downloaded file. Then, copy the contents of the "bin" folder to the "C:\OpenSSL" folder (you must create this folder). Finally, create a file "openssl.cfg" and paste this inside. In this file, you will need to change the informations of the "req_distinguished_name" section, as well as the values given in the "subjectAltName" line. - the informations you need to change are in red on the VMware site. - for the country code, see the "SSL Certificate Country Codes" page of the DigiCert website. This will create the certificate request in a "rui.csr" file and a private key in the "rui-orig.key" file. rui.key : the RSA private key. rui-orig.key : the private key generated at the outset. To obtain a valid certificate, you must send the certificate request to a trusted CA or submit it to your own CA. 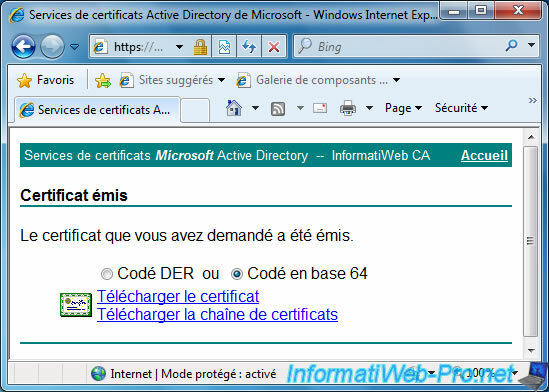 Once logged in with the domain administrator account, click on the "Request a certificate" link. Click on "advanced certificate request". 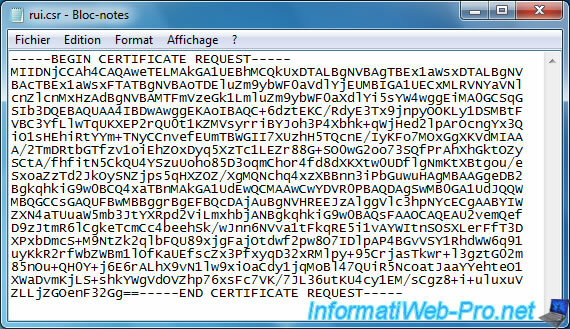 Then, as requested by VMware, you will need to submit your certificate request coded in base 64. Open the "rui.csr" file with the notepad and copy its contents (from the -----BEGIN CERTIFICATE REQUEST----- line to the "-----END CERTIFICATE REQUEST-----" line included). Then, paste it on the certificate request page of your CA. 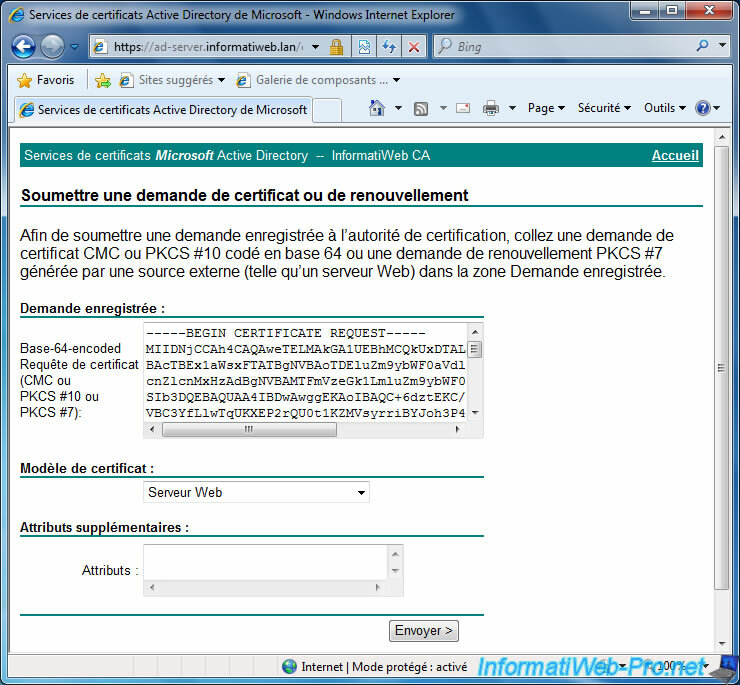 Select "Web Server" for the certificate template and click "Send". Confirm the digital certificate operation by clicking Yes. Select "Base 64 encoded" and click "Download certificate" to download your new digital certificate. Save this file where you want.